Rohit Shetty is probably the Salman Khan in the directors. No content but success is the surname. All his films were over-the-top but he is the favorite of the masses. Rohit Shetty , this time picks up a Telugu movie Temper which was a runaway hit in 2015. Temper starred Tollywood superstar Junior NTR in the lead. 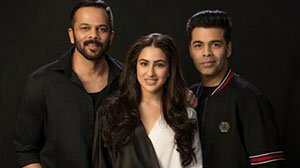 Sara Ali Khan is paired opposite Ranveer and the pair is certainly odd. Simmba (Ranveer Singh) is an orphan and determines to be a cop as he looks it as the most lucrative profession ever. He is posted as a cop in Miramar, where Durva Ranade(Sonu Sood) is the lord of the land. Simmba befriends Durva and all is well, until Simmba’s behen-like girl is raped by Durva’s brother. How Simmba teaches a lesson to Durva is the rest of the film. Except the hero being corrupt, the rest of the treatment is beaten to death in the 80s movies itself. The original script seemed to be totally tampered, by using unnecessary brains to make the outcome only a mockery. The original film has a very clearly defined character, but Simmba is confused. He is corrupt and softhearted at the same time. More than anything he is a cartoon of sorts. The proceedings introduce so much of drama where Simmba says villain’s family is his family and not just that but he makes them revolt against the villain at the end. How stereotypical can this further get? The biggest USP of the original was the preclimax and climax, and exactly at these vital places, the Hindi remake becomes farcical. There is a unintentionally funny cameo of Ajay Devgan as Singam and a sentiment waali court scene which was supposed to be intense. Ranveer Singh seemed to enjoy the role, but it was way over the top and his comic timing flopped at major places. It was sad to see a man who played Khilji with such a panache playing a baffoon in this film. Again, the fault lies in the director who gave him a cartoonish name and character. Sara Ali Khan is to be pitied to be cast in such a dance-and-disappear role. Good that Kedarnath had released before this. Otherwise her first film’s feedback would have been a disaster. Ashutosh Rana tries hard to shine. The character in Temper was one of the best supporting roles ever. However, Rohit teams has modified the role significantly and made his impact insignificant. The movie is way too long. A lot of time in the first half was wasted in unwanted comedy and senti scenes which no way helped the film. The movie begins only few minutes before the interval. You can see all the colors in palette like every Rohit Shetty films’ cinematography. The Aaankh maare remix is the only number that entertains. Simmbas intro song and a dreamy song in Switzerland add only to the already tedious film. The only positive in the film is Ranveer Singh’s liking for the role. All in all, ‘Temper’ tampered and made an outdated movie for the 80s.